Welcome to The Port Douglas Cottage & Lodge, two completely private, stand-alone, architecturally designed Queenslander style retreats. 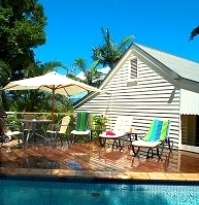 They are the only two, self-catering accommodation retreats in the centre of Port Douglas to each have exclusive use of their own private heated pool, sundeck and BBQ. 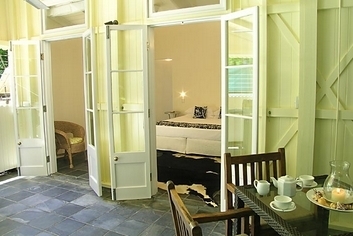 Nestled in a lush, vibrant tropical gardens that retains some of the original giant rainforest trees, both the Cottage and the Lodge have their own individual tropical character. 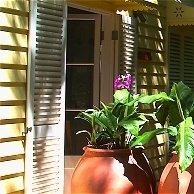 Typical of the Queenslander style buildings erected in the Port Douglas area over 100 years ago, The Port Douglas Lodge is a single storey building with wide, shady, cool verandahs, central 'bell tower' that enhances the natural airflow and light, exposed timber stud work and high cathedral ceilings. 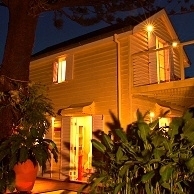 The Port Douglas Cottage is a romantic two storey structure of similar traditional Queenslander design. The spacious first floor loft bedroom leads to a expansive deck with spectacular sunset views over the rainforest clad mountains of the Great Dividing Range and north to the World Heritage listed Daintree Rainforest. 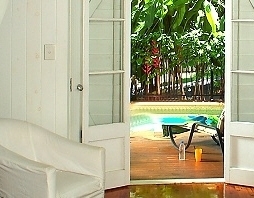 Celebrating a Port Douglas Wedding or Honeymoon The romantic Port Douglas Cottage is one of the most popular honeymoon hideaways worldwide. One bedroom apartment with your own private rooftop sun deck. Located in the centre of Port Douglas, we are on the corner of Macrossan and Wharf Streets. Ocean views from the front balcony. Resort pool and sauna. This owner managed apartment has under cover off street parking. 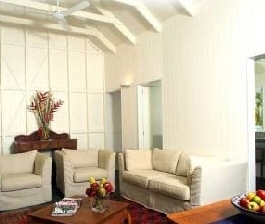 The Port Douglas Cottage is a stylish tropical romantic couples retreat, understated elegance, right in the heart of Port Douglas. Enjoy bright, breezy white & crispy interiors. A traditional Queenslander design, the spacious first floor loft bedroom leads to a expansive deck with spectacular sunset views over the rainforest clad mountains of the Great Dividing Range and north to the World Heritage listed Daintree Rainforest. The Cottage has its own private heated pool and spa and BBQ. Self catering with off street parking. 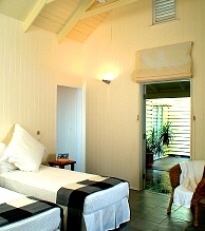 The Port Douglas Lodge is a single storey Queenslander with wide, shady, cool verandahs, elegantly understated white interiors all surrounded by lush tropical gardens right in the heart of Port Douglas. The two bedroom Lodge is self catering and has its' own private heated pool, outdoor sun lounges and BBQ. Check In 2pm unless prior arrangements made direct to Managers. 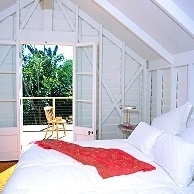 The one bedroom Cottage is suitable for 2 adults (+ 1 infant or + 1 child). Your little one is important to us, so we can provide a portacot or 1 rollaway bed, high chair & toys free of charge. We can also hire any other baby equipment (at an additional cost). 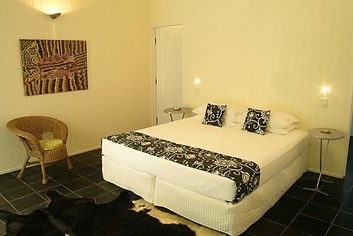 The two bedroom Lodge can accommodate up to 5 guests. It has 2 king beds, which can be split to singles. We also have 1 rollaway bed, portacots, high chairs & toys free of charge. The Cottage has one off street car space available free of charge. The Lodge has one off street car space available free of charge. 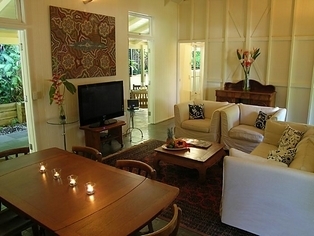 An hours travel north from the City of Cairns and Cairns International Airport, Port Douglas Cottage and Lodge nestles in the heart of Port Douglas Village.